Franklin Perez does not have any MLB stats for the season. Resides in Carabobo, VZ during the offseason...Participated in the Tigers Winter Caravan and TigerFest. Limited to seven starts in 2018, missing most of the season due to two separate stints on the disabled list...Sidelined from April 5-July 10 with a right oblique muscle strain...Sidelined from July 30-September 14 with right shoulder capsulitis...Ranked as the fourth-best prospect and rated as possessing the best changeup in the Tigers organization by Baseball America following the season. April 4, 2019 Lakeland Flying Tigers placed RHP Franklin Perez on the 7-day injured list. 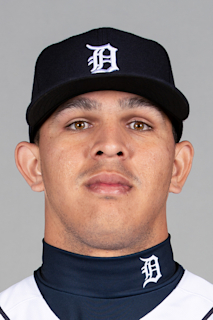 March 8, 2019 Detroit Tigers optioned RHP Franklin Perez to Lakeland Flying Tigers. November 19, 2018 Detroit Tigers selected the contract of RHP Franklin Perez from Lakeland Flying Tigers. September 15, 2018 Lakeland Flying Tigers activated RHP Franklin Perez from the 7-day disabled list. July 30, 2018 Lakeland Flying Tigers placed RHP Franklin Perez on the 7-day disabled list. July 10, 2018 RHP Franklin Perez assigned to Lakeland Flying Tigers from Erie SeaWolves. June 25, 2018 Erie SeaWolves sent RHP Franklin Perez on a rehab assignment to GCL Tigers East. March 30, 2018 Erie SeaWolves placed RHP Franklin Perez on the 7-day disabled list. September 1, 2017 RHP Franklin Perez assigned to Erie SeaWolves. July 12, 2017 RHP Franklin Perez assigned to Corpus Christi Hooks from Buies Creek Astros. September 21, 2016 Quad Cities River Bandits activated RHP Franklin Perez from the 7-day disabled list. August 27, 2016 Quad Cities River Bandits placed RHP Franklin Perez on the 7-day disabled list retroactive to August 25, 2016. May 18, 2016 RHP Franklin Perez assigned to Quad Cities River Bandits from GCL Astros. August 10, 2015 RHP Franklin Perez assigned to GCL Astros from DSL Astros Orange. May 29, 2015 RHP Franklin Perez assigned to DSL Astros Orange. July 2, 2014 Houston Astros signed free agent RHP Franklin Perez to a minor league contract.